A number of artists featured in the special exhibition Of Heaven and Earth: 500 Years of Italian Painting from Glasgow Museums are represented in the collection of the Milwaukee Art Museum. This is the first in a series of blog posts that will highlight Milwaukee’s paintings during the run of the exhibition. Antonio Balestra (Italian, 1666–1740), The Meeting of Telemachus and Calypso, ca. 1700. Oil on canvas. Milwaukee Art Museum, bequest of Eliza Eliot Fitch M1955.3. Photo credit: Larry Sanders. What does that mean? Well, it means that he worked during a time of transition between the theatrical narratives and dramatic light and shadow of the high Baroque (think Caravaggio) and the bright, elegant style called Rococo (think Tiepolo). Accordingly, the Milwaukee Art Museum’s painting by Balestra, The Meeting of Telemachus and Calypso, is filled with larger-than-life figures (Baroque) elegantly arranged and beautifully modeled with light colors (Rococo). Balestra originally trained in Venice, where the loose brushwork and atmospheric color of Titian had informed the work of generations of artists. Early in his career he spent time in Rome, where he was influenced the classical restraint of Renaissance artists such of Raphael. He eventually returned to Venice, where he had a long and successful career. The subject of our painting comes from a 1699 book by the French author François Fénelon. Called The Adventures of Telemachus, it was based upon characters from the Greek epic poem The Odyssey. Antonio Balestra (Italian, 1666–1740), The Meeting of Telemachus and Calypso (detail), ca. 1700. Oil on canvas. Milwaukee Art Museum, bequest of Eliza Eliot Fitch M1955.3. Photo credit: Larry Sanders. The female figure is the nymph Calypso, well-known for delaying the Greek hero Odysseus on his way home from the Trojan War. The young man is Telemachus, who, when his father Odysseus does not return home after the Trojan War, goes out to search for him. He is aided in his quest by the goddess Athena disguised as an old man named Mentor. When Telemachus lands on the island, Calypso immediately falls in love with him. Meanwhile, Telemachus himself falls in love with the nymph Eucharis. Despite this, he eventually leaves the island in order to do his duty and continue his search for his father. I love the composition of The Meeting of Telemachus and Calypso. All of the figures are close to the viewer, making us feel like part of the scene, and they crouch, twist, and balance in ways that at first make sense but upon further investigation are completely unnatural. They cascade across the canvas from the upper left to the lower right. Calypso leans back, dramatically enveloped in drapery and seductively revealing a shoulder, her one foot lifted gracefully off the ground and her other daintily resting on a toe. 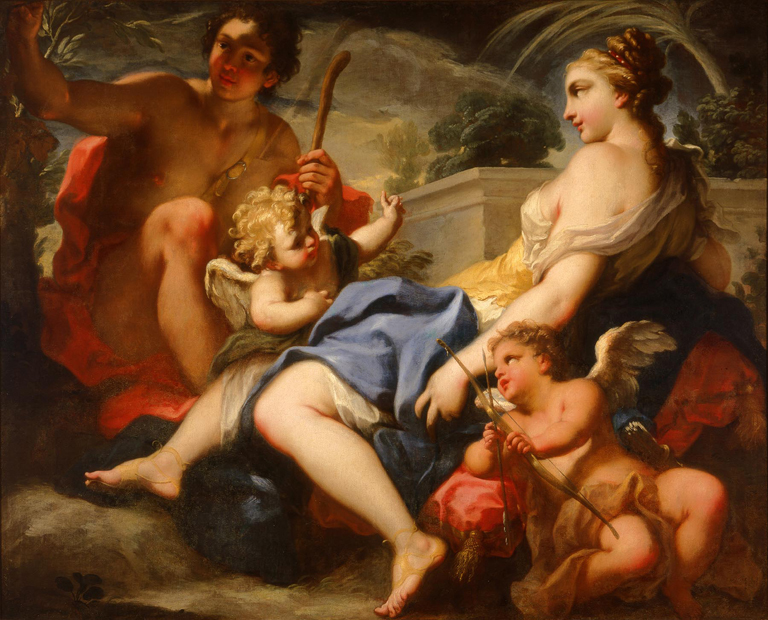 The putto in front of her points to Telemachus while Cupid sits behind her, his bow raised, symbolizing the immediate love that the nymph will have for the young adventurer. In the meantime, beautiful (and barely dressed) Telemachus holds a traveling stick in one hand and pushes a shrub out of the way with the other. He looks off into the distance for his father, unaware of Calypso’s gaze. In 1782, Angelika Kauffmann (Swiss, 1741-1807) painted a pair of paintings (here and here) for Monsignor Onorato Caetani in Rome. The Corcoran Gallery of Art owns a late work by Benjamin West (American, active England, 1738-1820). A masterful neoclassical painting by Jacques-Louis David (French, 1748-1825) is in the collection of the J. Paul Getty Museum. When our collection galleries reopen in 2015, you might see the Milwaukee Art Museum’s Antonio Balestra painting. In the meantime, you can see a lovely example of Balestra’s work in the feature exhibition Of Heaven and Earth: 500 Years of Italian Art from Glasgow Museums, on view at the Milwaukee Art Museum through January 4, 2015. This entry was posted in Art, Curatorial, Exhibitions and tagged 18th Century Art, Collection, European art, Exhibitions, Of Heaven and Earth. Bookmark the permalink.